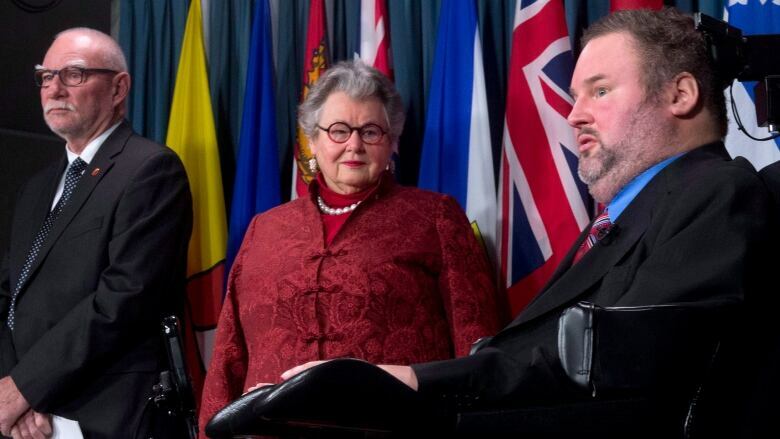 Thwarted in his efforts to force the House of Commons to debate the issue of assisted suicide, Manitoba Conservative MP Stephen Fletcher has gone down the hall for some help. Two senators — one a Conservative, the other a Liberal — are taking over Fletcher's bid to make physician-assisted death legal under Canadian law, introducing a bill on the subject in the upper chamber. It's an opportunity to spark a national debate on the contentious question -- and also a chance for the Senate to burnish its tarnished reputation, Fletcher told a news conference Tuesday. "This is an opportunity in fact for the Senate to shine, to demonstrate why the Senate is there," said Fletcher, who became a quadriplegic after a car accident in 1996. "They are dealing with an issue that obviously most elected representatives do not want to deal with. Moreover, I think the mere fact that it's now going to be debated in Parliament will increase public awareness, people will have this discussion with their families around the dinner table, which will prevent a lot of heartache in the future for those families." Conservative Sen. Nancy Ruth is introducing the bill with the support of Liberal-appointed senator Larry Campbell. Both say they believe their parties will help move it forward. "If you know Sen. Nancy Ruth and myself, we don't fight on hills we don't think we can take," Campbell said. Ruth said her aim to have it passed through the Senate by spring and then handed over to the House of Commons. It's possible that the Supreme Court, which is currently studying the constitutionality of the existing ban on assisted suicide, will have weighed in on the issue by then. But there is only so far the court will be able to go, said Dr. James Downar, who is on the advisory board for the advocacy group Dying with Dignity. "Ultimately the Supreme Court can only strike down a bad law," Downar said. "It cannot write a good law, it cannot create the safeguards needed, it can't create the oversight needed and it cannot provide the funding required to improve end of life care for all Canadians." The government's reluctance to wrestle with the thorny question of assisted suicide, meanwhile, has been well documented. "It is our government's position that the Criminal Code provisions prohibiting assisted suicide and euthanasia are in place to protect all persons, including those who are most vulnerable in our society," Justice Minister Peter MacKay said when the Supreme Court announced it would hear the appeal. An online poll conducted for the group in August ahead of the Supreme Court hearing found a significant majority of respondents in favour of allowing a doctor to help end a person's life, in certain circumstances. The bill being put forward in the Senate would impose strict guidelines on those circumstances and how a request for assistance would be approved. Among other things, it would impose a 14-day waiting period between a request being made and a doctor carrying it out. "This bill is fundamentally about choice," Ruth said. "It doesn't coerce anybody — not a physician, not a patient, not a family member, nobody. It is simply to provide a choice, another choice for Canadians, in how they choose to end their lives." The national association for Canadian doctors recently backed down from its long-standing opposition to assisted death. In August, the Canadian Medical Association changed its official policy to say it supports the idea of physicians — within the bounds of existing laws — following their conscience when asked to provide aid in dying. Ruth said she wants to see the CMA take that discussion even further. "The CMA is moving and this is exciting so the Senate is a good place for them to talk," she said. "And senators are close enough to death to want to do this," she added, to laughter. Should assisted suicide be a legal option?